September 9-15 is National Truck Driver Appreciation Week. This week is dedicated to all 3.5 million men and women professional drivers who not only deliver products safely, on time and securely, but they also help keep our roadways safe. In the trucking industry, many trucking companies are spending the week recognizing drivers for their commitment and hard work in one of the most important and demanding jobs in the economy. “Truck driver” is a popular profession within 29 states in North America. There are 3.5 million professional drivers in the United States. 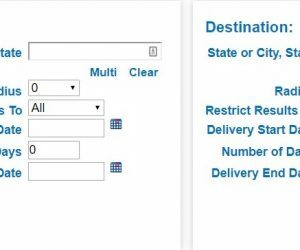 A driver typically records approximately 432 billion miles a year. This is close to driving to Pluto and back 25 times! More than 80% of freight weight in the United States is carried by trucks. Truckers carry $738.9 billion of goods and commodities annually. It is often nerve-racking to drive next to a big rig, but inside the cab of that truck could be a classmate you went to school with, a family member or a neighbor you have never met. Truckers are trained professionally in their career, and they take pride in truck driving and the safety efforts they even celebrate accident-free miles, because safety is not something they take lightly. You typically see a truck just about every day when traveling, we rarely take the time and think about the profession or the driver behind the wheel and appreciate how their job influences our life. There are over a million trucks each day traveling on American highways, and the person behind the wheel driving that truck is a hardworking individual. Regardless of the weather, backed up traffic, truck drivers continue to transport products to help the economy advance and to keep our lives supplied with all our needs and wants. 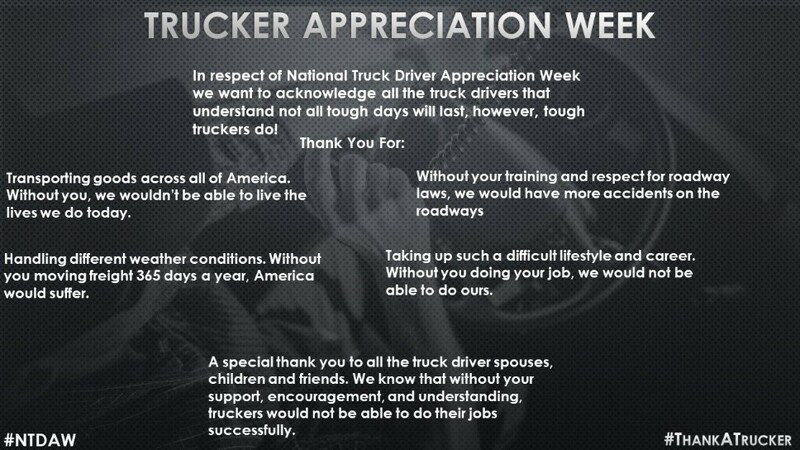 During the week of September 9-15, I encourage you to take a few minutes out of your day and think about a truck driver and the value of job, hard work and commitment. If you happen to see a truck driver out and about, just take a few seconds and thank these real-life heroes. Without the trucking industry and our much-appreciated truck drivers, our lives would not be the same. 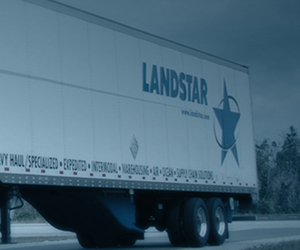 Here at Landstar, we salute these hardworking Americans who provide us with goods and commodities and give them the appreciation that they deserve but may not always get.